It was all Aussie, Aussie, Aussie in the Horseware Silver Fern Stakes this evening with Clint Beresford and Emmaville Jitterbug winning the class and the Australians taking out the Trans Tasman Test Match. Twenty-five started the class, with 13 combinations on five faults and less coming back for the second round. Brayden Aarts, who at 16 was the youngest rider in the field, rode the round of his life to go clear aboard last year’s Silver Fern Stakes winner LT Holst Aunty Annette and finish on four faults from the two rounds. NZ team-member Lily Tootill and Ulysses NZPH also went clear, but carried eight faults from the opening round. Keeping their slates completely clean were Beresford, Stuart Jenkins (Aus) on Fairview Aliquidam, Brooke Langbecker on Quintago I and the sole Kiwi, Katie Laurie aboard Casebrooke Lomond, setting up a hard-fought, hotly-contested jump-off. Beresford, who placed second in the Silver Fern Stakes in 2016 when he was last at HOY, was keen to go one better. However, he knew he would face stiff competition from his Australian team-mates and Australian-based Kiwi Laurie. Jenkins was first out and looked to have done enough with his 40.03 second effort. Beresford was next and as soon as he entered the ring, it was clear second was not on his mind. “I knew I would have to put my foot down,” said Beresford. But he was full of praise for his 12-year-old thoroughbred/warmblood cross Emmaville Jitterbug who found lines where others failed. Beresford and Jitterbug came home all clear, stopping the clock at 35.42 seconds. Laurie and Lomond gave it a good nudge with their clear round in 36.26 seconds but it wasn’t enough, with Langbecker coming home deceptively fast in 36.69 seconds but a rail at the last saw them finish in fourth place. The Trans Tasman Test Match was a one sided affair with the Australians finishing on zero faults from the two rounds, and the Kiwis in double figures. 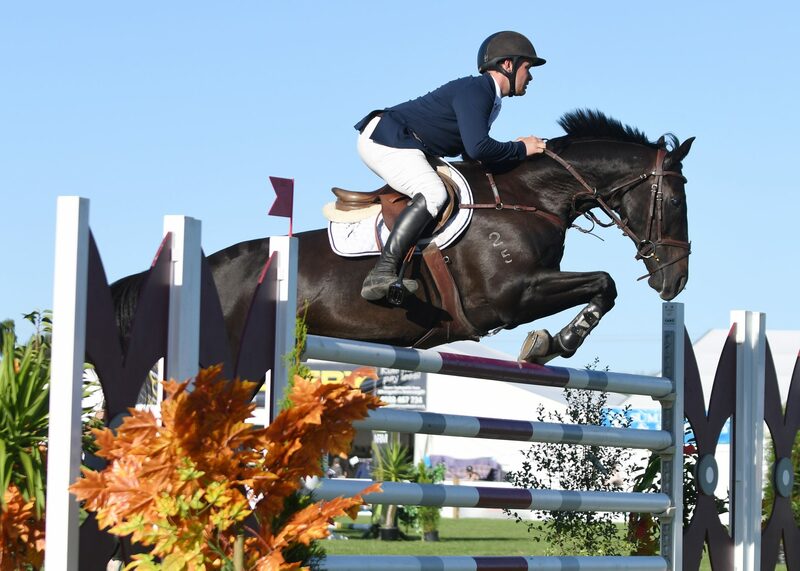 Horseware Silver Fern Stakes: Clint Beresford (Aus) Emmaville Jitterbug 1, Katie Laurie, Casebrooke Lomond 2, Stuart Jenkins (Aus) Fairview Aliquidam 3, Brooke Langbecker (Aus) Quintago I 4, Brayden Aarts, LT Holst Aunty Annette 5, Tess Clark, Sinatra II 6, Lucy Olphert, Eve Saint Laurent 7, Hayden James (Aus) James Continue 8, Brooke Edgecombe, LT Holst Andrea 9, Samantha Morrison, Biarritz 10.